Misc: These ant-like creatures live beneath the surface of the world in mid to large sized colonies. Wherever a pathway reaches the surface, a tall spire of sand or dirt (depending on the location) rises into the sky. The Myrmex are industrious and organized, collecting food and resources in large stores. They have long since shrugged the heavy reins of a matriarch and have become more independent. They work together for the betterment of the colony. If you help them expand and maintain the colony, they will gladly share their abundant resources. If you choose instead to steal what they have worked so hard to collect, they will attack. And they can dig, so it's not a good idea to anger them. 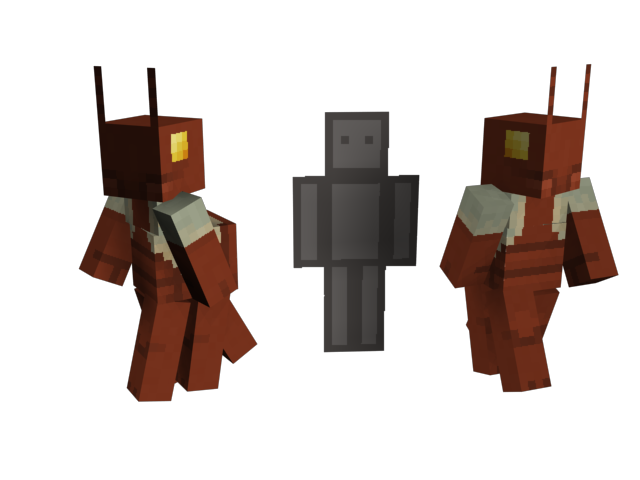 The Myrmex would be another group AI mob. They would be able to dig at about the same rate as the player, but would also be able to scale walls as if they had ladders (except glass). Let me know if you have any ideas or suggestions! Wow, so they're like human sized ants? Will they steal my food? Why does everyone who has more than 700 forum posts think that they are some sort of 'deputy-moderator'? Why is everyone on the Minecraft Forums so uptight? It's like a dictatorship. Calm down, it's just Minecraft. No, but they will harvest natural resources around their colony that you might want to harvest for yourself. 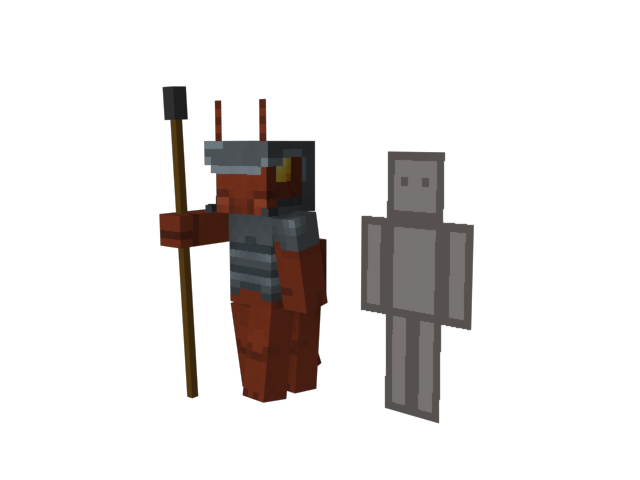 I would be awesome for these guys against an army of pigmen! So, if you go into their colony, will they get mad and start beating you into a (Cubic) pulp? They would be suspicious, but if you start working on stuff for them, then they would lighten up. This is great! But what do they drop on death? As with most of your ideas, love it. P.S. Where have you been? its been like 2 months since your last creature. Yeah lol. I just seen them. Well again nice work. VERY much like the Formians from Dungeons and Dragons. And that's not a bad thing. I actually like this. It's an interesting take on it. Would they use their gathered resources to make things other than the spire? Yeah. They'd make weapons and tools and chests to store it all in. Furnaces and such as well. I loved that design in the monster manual. I wasn't thinking of it consciously when I did the design, but I can't deny it probably played a large role subconsciously. I was thinking along the lines of structures, but yeah okay. Oh! Nothing above the surface, but rooms and such all connected underground. Interesting... if a Mound is close to a Grove, and the Myrmex try to harvest the trees, will the Sprites attack, causing the Myrmex to retaliate, meaning a massive war between the two? What if Magmen also joined the fight, accidentally burning down part of the forest, causing the Sprites (Normal and Cinder) to attack them, making the Magmen angry at the Sprites, and accidentally hitting a Myrmex when trying to hit a Grove Sprite, causing them to have a massive 3 way battle royal!?!!!?!? It'd be awesome. Creating an AI like that would be hard for Notch. I guess they could just make a formula in which there are randomly generated burrows wherever the creatures spawned, and it could be a random burrow out of a catalogue of like ten different kinds of burrows. But killing them would be a jackpot, since you could loot their things from the cheasts. Oh, almost forgot. I don't like the Legs. I think they should be more like that picture shown in an above post. I think it'd look cooler. I'll cry at the day these thing will be added! Can u make me a tissue?